A receptionist is one of the important person in any organization. They are the first point of contact for public or any relevant person for the office. They are an important part of any administration; their regular job role includes attending the call and forwarding it to the relevant person in the office. Providing the relevant information about the company whenever someone inquires about it over the phone. They are the first person to create the solid impression of the company. A good receptionist creates the best first impression of an organisation in the minds of visitors. Their job role also includes to greet the customers and provide the relevant information to the visitors, co-coordinating to send emails, fax and send couriers for the company coordinating with the courier service. They maintain various important records relevant to the company. They take notes for all the important information the boss shares and ensures that it is communicated to the relevant person. Though to become a receptionist one needs certain skills and qualities, there are also several advantages of being a receptionist. 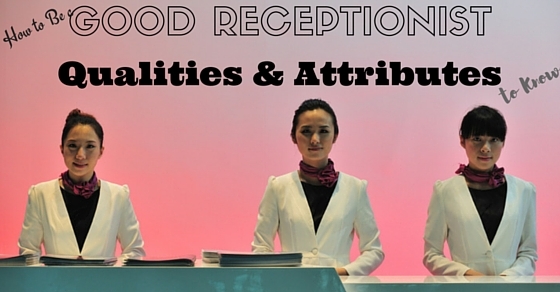 A good receptionist requires having a pleasing personality who is easily approachable. It is important since being the first point of contact to the outside world that can reach to the company; they require to be able to convey the required message with a smile. Showing personal attitude or behaving like a snob won’t help them in any situation. The personality not only signifies in body language but also while speaking over the phone. Since the majority of the people will call to enquire the about the information. A receptionist then required to answer them politely with complete and relevant information to the person on the other end of the phone. Being organized in their work is another important requirement for a receptionist job. There are so much of information is passed on through a receptionist each day, hence, to keep a track of it is of high importance. They require having all the phone numbers handy, messages ready and keeping the important data for the employee. At any given point of time, this information is required by the concerned person and the only way to deal with them is to be highly organized. The best way to be organized is to incorporate the filing system as per the content. Separating the data from employees, clients, boss, and courier. Even organizing folders in the computer is also important. One requires paying attention while naming the folders along with the date, otherwise when needed things might not be found. Imagine a scenario where exactly at the same time, the phone is ringing, employees are asking for some urgent data, a courier person is there and a visitor is standing. There are times when a receptionist may feel this situation to be panicky but with an efficient understanding of time management this can be handled easily. Sometimes the work in an office is in the role and they might be times when people are constantly moving, the best way to manage that will be to keep all the information ready. Having an understanding as to what is required and when is also of extreme importance. Finishing the work on time saves a lot of money and time for the company. Receptionist is the only job in the whole of the organization that coordinates and knows everyone in the office. The person is the one point of contact for everyone present in the office and they turn up to them for any issue that comes up. Hence, a good receptionist needs to be the foremost person to be a team player, if in case an ego arises towards a certain employee they need to keep all of it aside and help the employee. They need to cater everyone’s requirement no matter what is the designation of the person is. They are the one who are required to focus on getting the job done more than any other employee in the workplace. Communicating the right information to the concerned person is an essential, job requirement of a good receptionist. When someone comes with a query to them, they are required to communicate the information with clear instructions. They also need to be clear to inform the employees about the message left or any other information is to be passed on. Communication not only signifies words also in the manner it is dealt with, including a positive body language. With all the skills and knowledge comes another important aspect of being a receptionist. That is having a good dressing sense, it adds to the overall personality. Consider a scenario where a receptionist in a hospital comes dressed in tattered denim; this will provide a wrong impression to the place, because every place has a certain essence to it and appropriate dressing or following the dress code becomes important. With so much of things to be done in a day, a receptionist needs to be a good with multi-tasking. She needs to know how to handle the calls well, answer employee queries, pay attention to information to be passed on, manager-employee information and much more. None of it can be done efficiently or on time if the person is not good at multi-tasking. They don’t have the luxury to focus on only one job like other employees, they need to delve into multiple areas of work at the same time are expected to deliver to the level of perfection. Knowing and doing more is what makes them highly efficient. Technological skills are important for the receptionist. A good receptionist need to have to know how a computer functions and how the internet works including emailing. This is helpful as it will make their job easier and efficient. Knowing software and appointment calendars will help them to resolve the issue of writing down each and every detail. They can set the alert for it and if in case they tend to forget, this alert will remind them the information. Tools like outlook and other additional email sending tools are effective for work and for communication and keeping an interest in the technology will come as an added advantage to them. Learn as much as you can about the company, from its history, achievements, name of the CEO, number of offices across the world, product and services and as much more you can acquire company related information. Being an important point of contact it is important to have the good knowledge about the company, also learn about the newer services introduced by the company. All these information might not seem relevant but it helps if in case a person comes with and asks something. It will definitely save from the embarrassment. Receptionist is required to be someone who can be trusted. A situation where if the phone is ringing and it is not answered leaves a bad impression about the organization. They need to cater the employee requirements and resolve the issue at its best so that the employees don’t have to look further ahead. They need to ensure that the entire job is done on time and people can trust them with their information and data. Reliability is a huge factor in this job; the boss needs to have all the work information to be safe and when a receptionist does their job well, they become a highly integral part of the company. Hence, leading it to a long-term employment with the company, since, the receptionist is one profile which a company does not prefer to change or replace easily. Listening to what the information is communicated is important because missing the detail in the information can cost huge losses to the organization. For example, if a client leaves the message to be passed on to the boss then the receptionist needs to convey the correct message on time. Listening attentively is important in all aspects, be it a phone or in person, by a courier person or a client asking a question. Attentive listening can also help in resolving a lot of problems in one go. If one finds it difficult to remember everything then it is best to take notes of all the important information that is given to them, and it can be organized accordingly.So, a good receptionist must be a good listener. It is important to treat everyone equal from the office boy, courier person or the boss. Politeness is expected to be the natural element of a receptionist. They need to greet the person with politeness and appreciate everyone around them. This is good not only for an individual but it is also a form of branding for the company which showcases that the company is customer friendly and treats everyone equal. Being an ambassador for the company this automatically becomes a part of their company code and is also ethically right. It will also make you remember easily among the people and whenever something goes wrong you will be the first person to come for to find the solution. There are times in the day when the work of a receptionist becomes slow; there might be no calls and queries to answer, or no problems to attend to. Hence, it is best to keep doing some or the other work, like read a manual or learn something new on the computer rather than sitting idle, doing your nails etc. Since at any given point of time, someone can come to the office and this will create a wrong impact on the person while keeping busy will help in creating a good image of the person and the place. A good receptionist should not feel irritated by the constant ringing phone or people asking them questions continuously. Customer service should be their prime interest if at any given point of time irritation comes in between this will hamper their job, because of all this is their part of the job. There could be instances where a customer might be angry or shouts on the phone or might be rude, it is the receptionist who needs to maintain the calmness and resolve the issue. Since there could be various scenarios rising in the picture and losing out on it won’t be helping the situation. Being the only source of point of contact for the entire office, a receptionist comes to know everyone in the office and is the only person who gets the opportunity to meet most of the people in the organization. Hence the chances of knowing the incidents happening within the office or in the personal life of an employee increases. It is advisable to become a secret keeper rather than sharing the details with others because one or the other way people tend to enquire about the happenings in others life. Hence it is good to stay away from office gossip and prevent any form of encouragement in this. As this might have an impact on your work too. These are some of the tasks of receptionist meanwhile, these can vary depending upon the industry. For example, a receptionist job in government offices will be different from the hospital environment. A receptionist is a company’s ambassador, being the first point of contact for everyone from outside world from the company, they are the one who can create that first impression about a company. Hence, a good receptionist needs to have a great and pleasing personality. A lethargic receptionist is not well appreciated anywhere. They need to be active For example; people coming for interviews can get an initial experience of the company before entering for the interview. Another one is important for those who are the official visitors from the country and abroad. A good receptionist can leave a lasting impression of the company on the visitors. The job of the receptionist might seem a small one but it is of extreme important job role to handle. With so many new organizations coming up the job prospect for a receptionist has increased over the time. With the right attitude and personality, the chances of growth are immense.